After spending two years away from Supercross, Mike Alessi was called back to fill in on the Smartop Motoconcepts Honda team. Now 30 years old, it has been two years since Mike Alessi last lined up on a Supercross track. However, when the Motoconcepts Honda team was decimated by rider injuries, first Malcolm Stewart, then Vince Friese. The #800 was recruited to fill in and keep the team going. Originally Mike was only asked to compete in four rounds before preparing for the Canadian outdoor nationals. 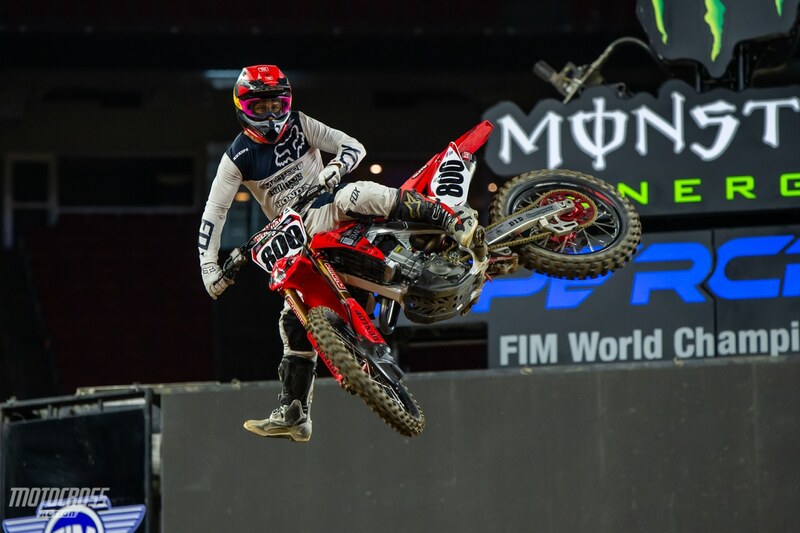 Now with Justin Brayton sidelined, Mike will add on a couple more events to his schedule. 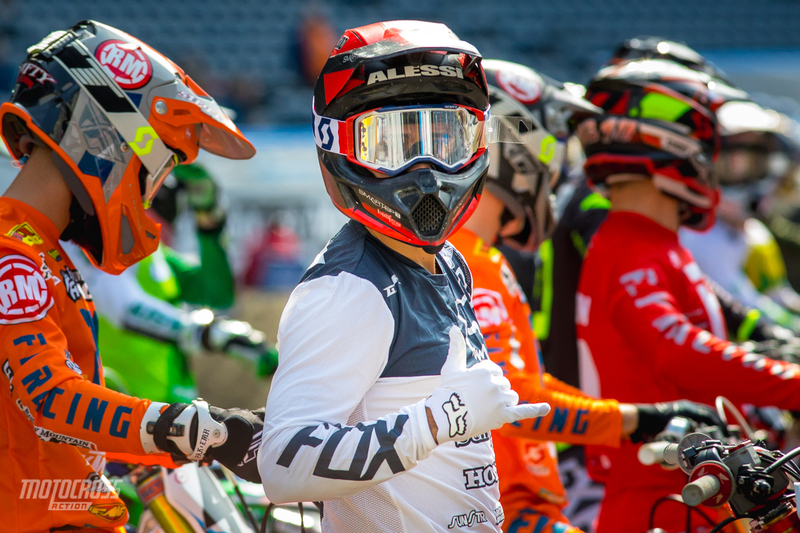 We asked Mike Alessi to give us a brief lowdown on the situation. MIKE, HOW LONG HAS IT BEEN SINCE YOU LAST RACED SUPERCROSS? It has been about two years. Detroit 2017 was the last Supercross, back in March of 2017. My first race this year at Atlanta was in the beginning of March of 2019, so it has been almost exactly two years. HOW WAS IT COMING BACK? I WOULD ASSUME IT WAS A BIG ADJUSTMENT. Oh, for sure, just getting dropped into the deep end of the ocean with the world’s best riders in Supercross half way through the season is not an easy task. To say, “hey you get to go race these guys, not only race them, but qualify, and make the main event” was not too bad. I got 16th in my first main. I am happy to be back and thankful to the Smartop Bullfrog Spas/Honda Team, and Fox and GDR, to let me fill in for Vince Friese. It was very unfortunate for him, and for Malcom Stewart getting hurt in Glendale. I was just filling in for four races. 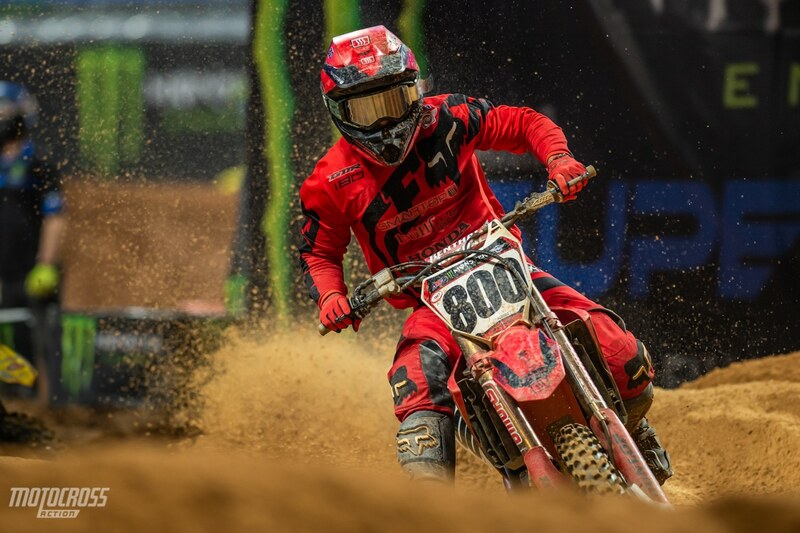 Seattle was supposed to be my last race until Justin Brayton got injured. 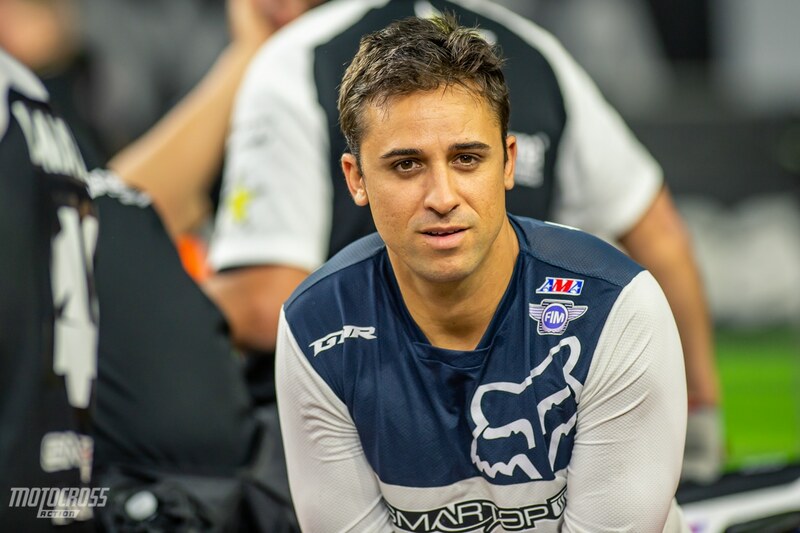 After becoming a Dad, Mike Alessi gained a new found motivation for racing and he’s enjoying his time as a Supercross fill in rider. YOU REALLY DID NOT HAVE MUCH TIME TO PREPARE DID YOU? No, I rode three days. I rode Friday, and Sunday when my dad landed from Detroit. Then I rode on Tuesday at the Honda track so that way we could ship the bike to Atlanta to be able to ride Press Day, so yes, three days. 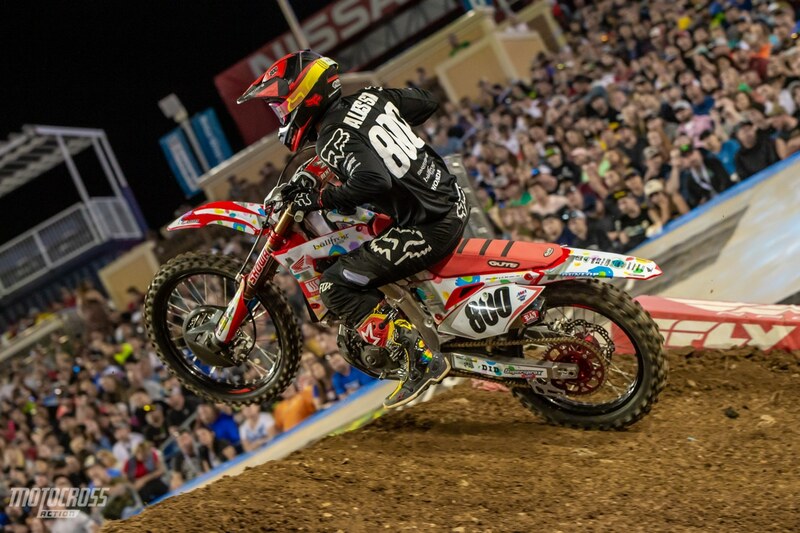 YOU ARE ON A HONDA FOR SUPERCROSS, WHICH IS NOW THE SAME BRAND YOU WILL BE RACING IN CANADA; THAT HAS TO MAKE IT NICE. Well, I am riding the Motoconcepts Smartop bike in Canada. I am just teaming up with GDR for the summertime. So, same bike. Everything is the same. Nothing is different as far as bikes and parts and everything like that. Mike throws some style during press day in Houston. YOU HAVE MADE FLORIDA YOUR HOME THESE DAYS RIGHT? Yes, I love Florida. It is warm and sunny. California, don’t get me wrong, is a great place, but it is just not for me. I just can’t deal with the people, the traffic, the $4.00 gas prices. I mean you are out of your mind paying that, and all the taxes. In Florida I love the weather, and I love the people. I love how there is no traffic where I live and there is only 2,500 people that live in my town. One stoplight, one gas station and grocery store. It is pretty simple living here. AND NOW YOU ARE A FAMILY MAN WITH A DAUGHTER, HOW OLD IS SHE NOW? She just turned 8 months. So, she is wide-open, keeping us young, keeping us running after her a lot, and it is definitely life changing. I would not have it any other way. I love having my daughter and my wife here at the races with me, so definitely a life changing time, and I am excited for the future. I’d like to try to race a couple more years, at least two to three more years and after that just be a great husband, and that is it. Out of the six races Mike Alessi’s has competed in so far this season, his best finish has been a 13th in Seattle. HAVE YOU FOUND WHAT WORKS WELL FOR YOU AND YOUR FAMILY WITH RACING IN CANADA DURING THE SUMMERS? Yes, for me, racing in Canada is just a super fun deal. It is only 2 and a half months of work. June, July and basically by the second week of August, we are done with the season. So it is quick, fast and it is only eight rounds. The competition up there is pretty stiff. There is about four or five of the real fast guys, I guess you could say. Racing in 65 to 75-degree temperatures, you can’t beat that in the summertime. We have great fans up there and the competitors I race against are awesome too, so it is good comradery between us. The first round of the 2019 Rockstar Energy Triple Crown MX series will kick off June 1st in Calgary. This year Mike will be racing on a Smartop Motoconcepts Honda with help from the Canadian GDR Honda team. IT SEEMS LIKE A LITTLE BIT MORE OF A FAMILY FRIENDLY ATMOSPHERE. It is and is definitely laid back. The fans, the people, the weather. It is just a combination, and that is why I like racing up there. It is a lot more laid back and it is not super serious like it is in the states. It is just super cut throat here. So that is pretty much the main reason for my Canadian racing, and obviously the other nine or ten months of the year, I get to be home with my family and enjoying it, so that is always really nice. Not living out of a suitcase and traveling from hotel to hotel and city to city. I get to take my motorhome on the road in the summertime and get to have a fun family vacation for the summer. While doing it, I do a couple of races and then it is over. Mike Alessi’s bike with the special edition graphics inspired by the St. Jude Research hospital “THIS SHIRT SAVES LIVES” movement. THE LAST COUPLE OF YEARS YOU WERE ON FACTORY KAWASAKI IN CANADA. NOW I IMAGINE IT WILL BE SMOOTHER BY RACING THE SAME BIKE IN SUPERCROSS. Well, with the Honda, I feel like this bike was made for me. It is a little bike and it fits me very well, and I have great sponsors. Being with Kawasaki the last three years, it just kind of ran its course. I felt like things were getting stale and I needed a new change and that is why it is good for me to be back on a Honda. 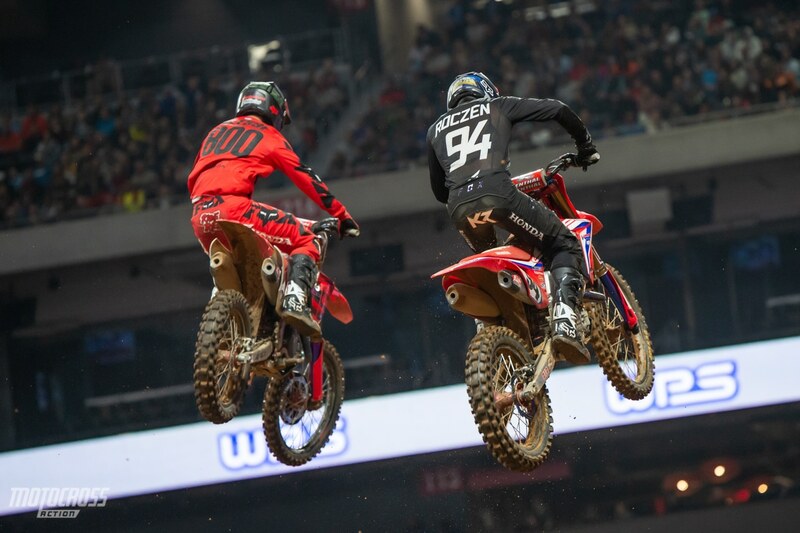 Mike Alessi and Ken Roczen side by side in Atlanta. WRAPPING UP, IT SOUNDS LIKE YOU STILL HAVE A COUPLE MORE YEARS OF RACING? I really do. Now that I have my daughter here, it is like a second wind or rejuvenation or whatever you want to call it. I just feel motivated again to be training and riding and just enjoying it again, where previously I was starting to get a little bit burned out. You know, back during 2017, 2018 I was just kind of over it. Now that my daughter is here, it has given me like new life again, so like I said, I feel like I could go at least another two to three years and after that for sure, 100% be done.